Apartment Carla Pietro is located in a residential building, in serene environs, just 3 kms. from Florence City, Tuscany. This medieval building has six apartments, of which Apartment Carla Pietro is one. All the apartments have independent entrances and are self contained, offering guests total privacy. The hill of Settignano forms a stunning backdrop for Apartment Carla Pietro, which is set among olive groves, vineyards, cypresses and oak-trees. The building dates back to the 16th century, and has been renovated recently to add all modern amenities while retaining its medieval charm. Terracotta tiles, stone walls and arches, beamed wooden ceilings, wrought iron trellis, antique furniture and the spectacular view of the Tuscan countryside add mystique to the apartment. Santa Maria Novella train Station is located in close proximity to the apartment building. The apartment can be easily reached, by bus, car or by train from anywhere in Tuscany. Apartment Carla Pietro is spread over an area of 60 sq. meters. It is located on the first floor. This vacation home rental has rooms to accommodate 4 guests (2+2). There is a spacious living room with a double sofa-bed for two additional guests; a dining area and a kitchen that is well -equipped with a dishwasher, fridge, freezer, microwave oven, electric coffee-maker and cookware. There is 1 spacious double bedroom with a matrimonial bed and 1 bathroom with a shower cubicle. 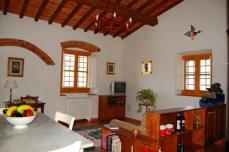 The rooms are spacious, with wide windows overlooking the Settignano countryside. The entire apartment is bright and airy and well furnished. Other facilities the apartment offers are: satellite television, unlimited internet connection – both wi-fi and cable connection, bed linen and towels. Great attention has been paid to the furniture and to the maintenance of the apartment. Baby cots and high back chairs can be had on request. Air-conditioning is available on request, though it unnecessary in the pleasant atmosphere that is prevalent in this area. Guests can also avail the facilities of a washing machine. Apartment Carla Pietro has a lot more to offer its vacation guests. For those who love the outdoors, there is a swimming pool, located in the grounds, in the midst of the striking Tuscan country side, where guests can swim and relax under the warm Tuscan sun. There is a barbecue also for the guests to enjoy a great dinner out among the swaying cypresses feeling the gentle breeze that blows across the Tuscan country side. 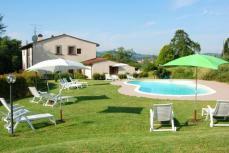 The Swimming pool and barbecue are shared by all the six apartments. Parking space is also available. Italy tours, wine tasting tours in the Chianti region, visits to Florentine museums, transportation and other arrangements can be done with the help of the staff members at the apartment building. Guests can also buy ‘Firenze Cards’. The Card is valid for 72 hours, and gives free admission to visit all the major museums, historical gardens and monuments in Florence, with this tourist can avoid long queues at the ticket offices. Tuscany has so much to offer its guests, that once in Tuscany one can never say goodbye, as one always returns to this paradise on earth!